Design after a memorial honouring St. James of Compostella, likely a stained-glass window representing Guy de Brimeu and Antonia de Rambures as main patrons (after 1463). Southern Netherlands, c. 1520s (?). Design after a stained glass window hypothetically representing a commission of the Brimeu-Rambures families, the original window (c. 1465) otherwise unknown. The four other images conceivably represent members of the same families. Pen-drawing in ink and watercolours on paper. Leaf: 410 x 275 mm. The elongated and upright composition in several columns likely represents the design of a stained-glass window in a church or chapel devoted to St. James of Compostella, patron saint of pilgrims. In the center, below St. James, an angel holds two shields, each with a coat of arms that represent a couple, husband and wife, who likely were the main patrons of the commission. The man, at center-left, kneels before a prie-dieu, dressed in armour. His arms are represented on his cape and shield and his crest is held by a lion. 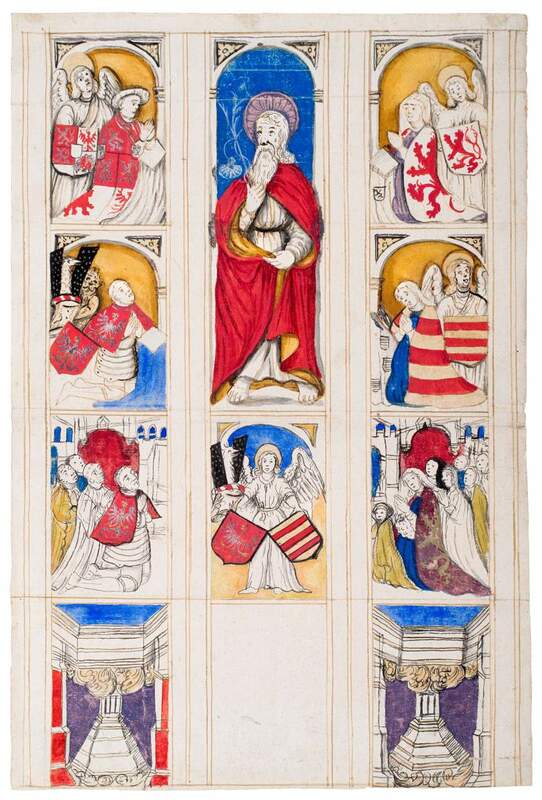 At center-right, the wife's robe and her shield, held by an angel, both present the arms of the Rambures family (Picardie): d'or aux trois fasces de gueules. If correct, this would identify her as Antonia de Rambures who in 1463 married Guy de Brimeu, lord of Humbercourt. The official coat of arms of Brimeu, however, is: d'argent, à trois aigles de gueules (here reversed, and only one eagle, yet the crest is correct). Guy de Brimeu was a loyal servant of the Duke of Burgundy, who, after the duke's death in 1477, was accused of treason and put to death in Ghent. Such memorials were commissioned for the glory of the saint and to remind those who would look upon the luminous window to devote their prayers to the salvation of the souls of those represented.